The Ritz Madeira was opened in 1905 by Christian Ritz, a New York businessman whose family was originally from Switzerland. 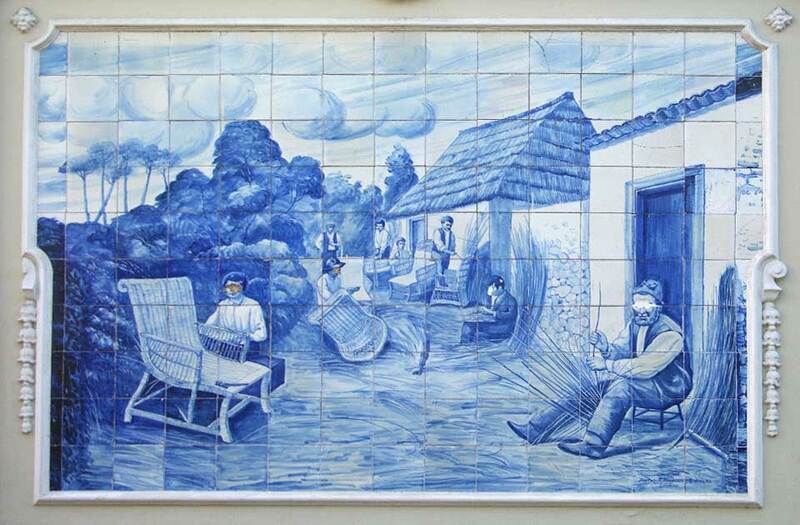 Christian Ritz was a successful textile merchant doing business between Europe and the Americas. While sailing on a merchant ship across the Atlantic from New York to Southampton, there was a storm off the coast of the Canary Islands and the ship went off course taking them to Madeira Island. 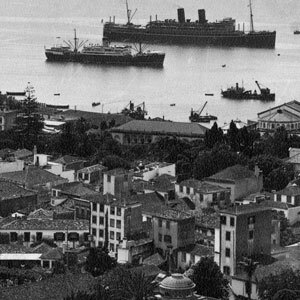 The ship was safely sheltered in Funchal, the capital on the south of Madeira Island. This storm was much like the famous storm of 1419 in which two of Prince Henry the Navigator’s Captains, João Gonçalves Zarco and Tristão Vaz Teixeira, were led off course and founded the island of Madeira, taking possession of the island for the Portuguese Crown. Christian was enchanted by the beauty and charm of the island and booked into a hotel where he stayed for several days until the storm subsided and the ship resumed its voyage. 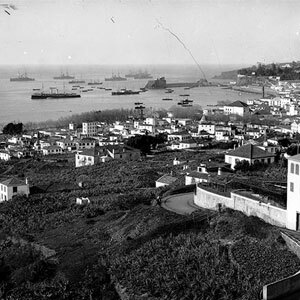 During his time on Madeira he took a tour of the island, this included a trip to the north, to a village called São Vicente. He had heard the village had a rugged coastline and some beautiful rock pools. He walked along the coastline and against the backdrop of the shimmery peach sunset where he saw a group of girls with flowers in their hair. They were in the rock pools drying salt. As he watched them in the dusk sky on a warm January evening they looked like mermaids. He was captivated by one particularly beautiful girl with long jet black hair and the most beautiful angelic smile he had ever seen. He knew that she was going to be significant in his life and would soon fall in love with her. He would later discover that she was eighteen and came from the local village; he was in his mid thirties. 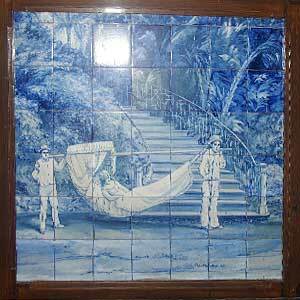 He watched from a distance and after sunset he returned to his hotel in Funchal. He could not stop thinking of her... It was a long journey on tricky, windy roads back to São Vicente; the roads could be quite dangerous when it rained as they curved at sheer cliffs. However, he returned the very next day, in the hopes of seeing her again. He waited at the rock pools with a bunch of white roses all day, but she had disappeared. Finally, he asked a fisherman at the rock pools if he knew of the young lady that he described. The fisherman did not understand much English, but he nodded and said “Clara”. He walked Christian to a wine bar where he introduced him to a waitress who spoke some English and helped Christian find this young lady he had described. However, she warned him that Clara had a boyfriend, an English engineer working on the installation of electricity on the island, but would introduce him to her. Clara’s angelic smile captured Christian’s heart and his dedication, charm and kindness made her feel very safe with him. Christian Ritz left with the merchant ship the next day, but he promised to return. 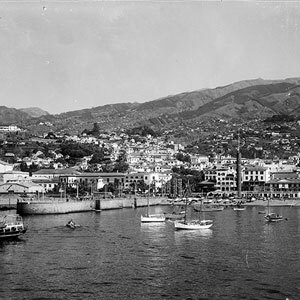 Five months later he was finally able to make his way back to Madeira Island, only to find that Clara had not received any of his affectionate letters and that she was now engaged to the English engineer. Christian was very disappointed, but he did not give up, he made regular trips to visit Clara. After sometime, he proposed and she told him she wanted to know him for four seasons before she made her decision. She did however leave the engineer at this point. 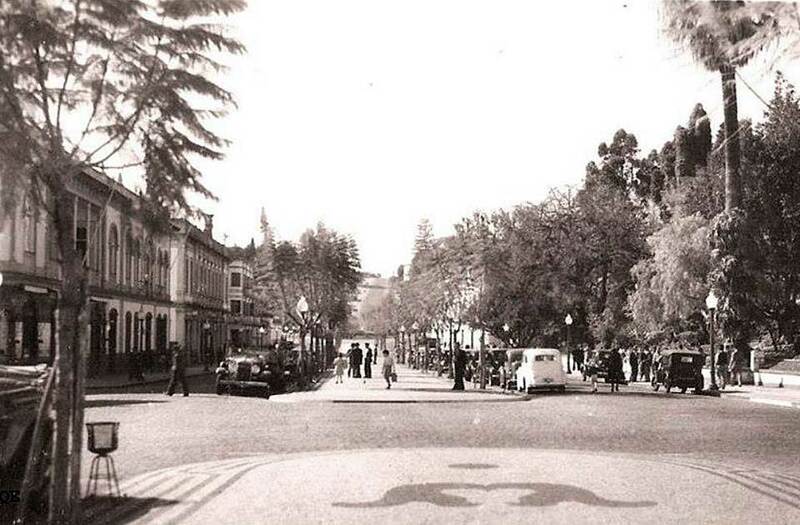 In 1904, while pursuing Clara, Christian opened with a partner a small cafe in Funchal and named it the Ritz. He eventually won Clara’s hand. Christian relocated the Ritz in 1910 to its current location with a wonderful esplanade and an upstairs terrace overlooking Clara’s favourite garden. 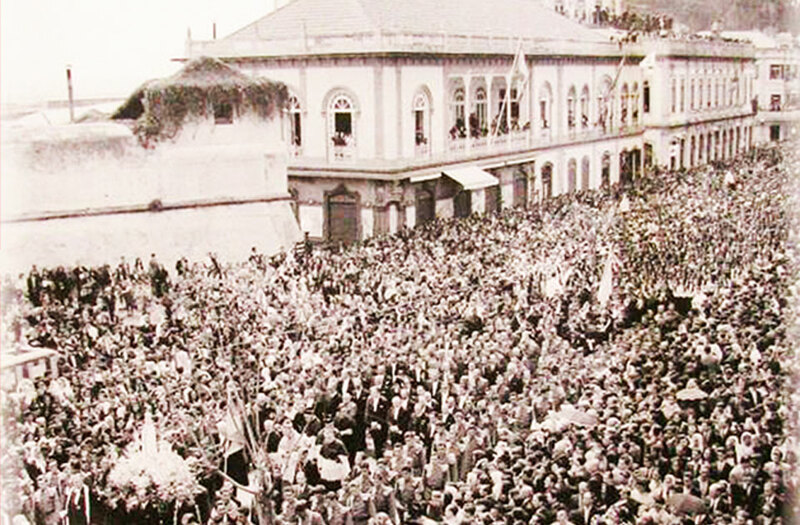 Christian and Clara started a family and made Funchal their home. The Ritz was a charming cafe for the society and businessmen, who met for afternoon soirees, dancing and high tea. For more than 100years the Ritz housed the 1st ever Madeira Chamber of Commerce called ACIF. Recently, Eduardo, the son of one of the Ritz’s original clients, a successful businessman in the booming embroidery industry, told us his memories of his father at the Ritz in the early 1900’s. 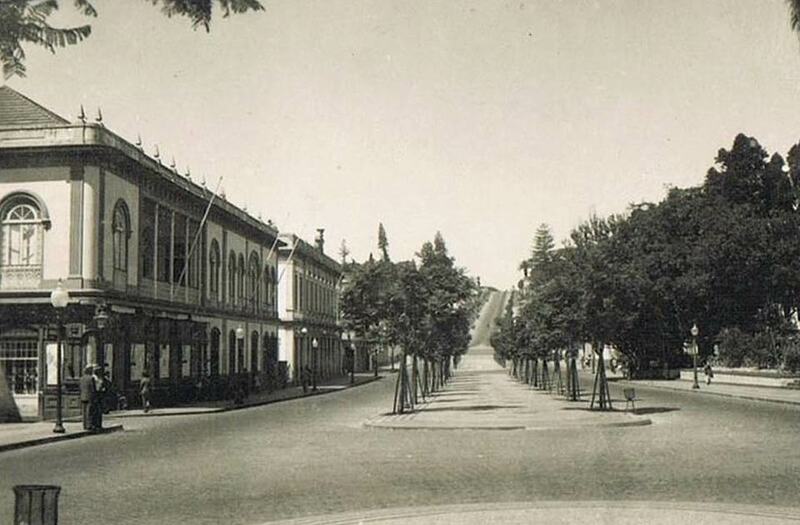 When the first cars came to Madeira, Eduardo’s fathers chauffeur would drive him to the Ritz and park right outside where he would then climb out, circle his car and catch the eye of the ladies, then walk past all of his colleagues and friends to the Bank of Portugal a 100 meters away. He would return 10 minutes later for a glass of Madeira Wine. He liked to give the impression that his business was so successful that he had to make regular trips to the bank to deposit his weekly fortune. It was all for show as he was just getting some change and impressed all those sitting enjoying a coffee on the wonderful esplanade. After a few years Christian and Clara had to leave Madeira to deal with his family affairs in New York and Philadelphia. The Ritz continued to exist in many forms from a high society cafe to a show room for imported cars, it was one of the most beautiful show rooms in Europe as all the original interior features of the Ritz were elegantly maintained. In 2007 there was a fire that destroyed the roof of the Ritz, but the interior was not at all harmed. The chamber of commerce moved to new premises nearby. After the roof was restored in 2011 the whole building was taken over by a new company and management team with a background of over 40 years in hospitality and entertainment, thereby keeping the spirit of the original Ritz alive! The teams experience in entertainment includes several 5 star hotels, the Lido de Paris and Moulin Rouge in Paris, bringing all the glamour, entertainment and magic back to the Ritz. The new owners ensured the building was restored from the foundations through to the interior decor and all the original fittings have remained intact. 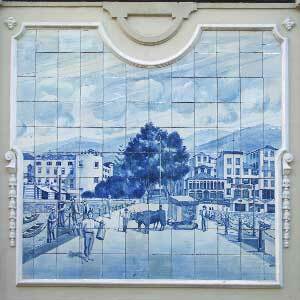 The Ritz is considered by many to be the most majestic building on the main street of Funchal. 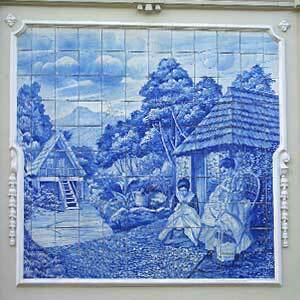 The famous blue and white antique tiles tell the tale of the history of Madeira Island from the 1st navigators to the farmers, traditional dancers, tourists and traders who visited the island. In the main restaurant upstairs you will see the large gold gilded, ornate mirror, which has travelled all the way from Cardiff Castle to the Ritz in Madeira. The delights of fine dining, classic Madeira Wines and popular, reserve Portuguese Wines have returned to the Ritz, offering you both an authentic Portuguese experience and a taste of the charm of the Ritz in the 1900’s.